Multi Grain are a great snack for the little ones and for us that are grown. 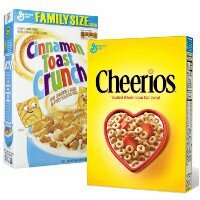 MultiGrain Cheerios Cereal is a perfect snack food. My four children have been eating it for years. They love it plain, in milk and mixed with yogurt. I love Honey Nut Cheerios and I have no concerns or worries when my two children are eating them for breakfast or for snacks. They have a better taste than the regular Cheerios but are covered with sugar. Excellent. I have this for breakfast every morning. Also makes a great low cal nutrient snack to munch on while watching TV. Cheerios are just the best. Taste good and seems to lower cholesterol.